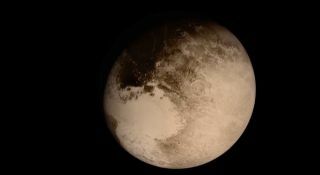 Screenshot from a new video of New Horizons' historic July 2015 Pluto flyby. The video was created using images captured by the spacecraft. An amazing new video takes viewers along for the ride during a NASA spacecraft's epic July flyby of Pluto. The Pluto flyby video gives a probe's-eye view of the historic July 14 encounter, during which the New Horizons spacecraft zoomed within just 7,800 miles (12,550 kilometers) of the dwarf planet's frigid surface. The short video stitches together real images captured by New Horizons, showing a dramatically sped-up depiction of the probe's approach and close Pluto flyby, as well as its passage out into the dark depths of the faraway Kuiper Belt. It was assembled by Stuart Robbins, who was a post-doc student at the Southwest Research Institute who worked on the New Horizons mission. New Horizons kept its eyes trained on Pluto for a spell after the flyby, watching the dwarf planet pass in front of the sun to learn more about the icy object's wispy but far-reaching atmosphere. The New Horizons team has received only a tiny fraction of the flyby data; it will likely take the probe until the end of 2016 to beam all of the images and measurements captured during the event back to Earth, mission officials have said. But the observations that have made it down to mission control have already revolutionized researchers' understanding of Pluto, showing a complex world with towering ice mountains and vast ice plains. New Horizons' images show that large areas of Pluto are completely or largely crater-free, suggesting that the dwarf planet remained geologically active until the recent past — and may even still be active today. New Horizons' photos have also revealed huge canyon systems on Charon, the largest of Pluto's five moons, and given scientists their first decent looks at small satellites in the system, such as Nix and Hydra. The $720 million New Horizons mission launched in January 2006 to lift the veil on Pluto. But the probe's science work is probably not done: Mission team members announced last week that they plan to target a small Kuiper Belt object known as 2014 MU69 for a close flyby that would take place in January 2019. New Horizons' handlers plan to perform several engine burns in October and November to put them on a course for 2014 MU69. But for the future flyby to occur, NASA must officially approve a New Horizons mission extension, which the team will apply for next year.